Tonight I've cooked for friends who are about to emigrate. My heart aches and so does theirs. But tonight is not about sadness. We haven't seen them for a long time and we love their company. And our friendship will always be. No matter the distance. And while others in the Great Emigration Debate play the Blame Game; harshly judging those who decide to relocate, or by being fiercely negative about South Africa, thankfully in our friendship there is neither. You have to get to that space in order for a friendship to still be. I recently read Kevin Bloom's heartbreaking and inspirational book Ways of Staying. And I'm glad I did. Read it. If you can. If you're battling to find some answers. If you're brave enough. So what do you give to friends who are and will always be South African? And who are going through the torment of leaving? 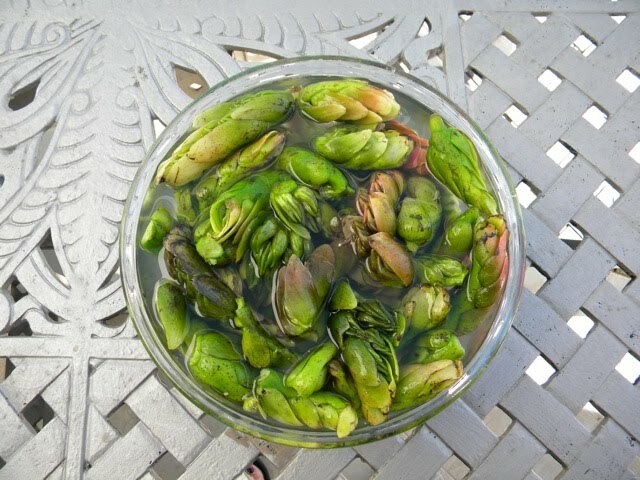 I made them a Waterblommetjiebredie. (translated as a Water Hawthorne or Cape Pondweed stew, but please don't ever use the translation, it really doesn't do this local delicacy justice). Waterblommetjies have strongly scented flowers, but they are valued for their fleshy edible bulbs, and can still be found in streams, small rivers, and you used to be able to buy them along the side of the road. It's slightly dodgy these days, what with pollution and all, so its probably best to buy them from suppliers who specifically grow them. I bought mine from Fruit and Veg City. Anyway, waterblommetjiebredie is a simple stew to make. Brown the lamb knuckles in a bit of oil with salt and pepper and if you like some seasoning. Then remove from the pot and allow to rest. In the sticky, meaty residue, add a splash more olive oil and brown some onions with plenty of garlic. Then add the browned lamb knuckle pieces to the onions in the large pot again. Adding beef stock ( I like the strong meaty flavour of it) and water and allow to stew. Keep on adding water so that the stew is nice and runny, and beef stock if you think it necessary - to taste obviously. Allow the stew to softly simmer and rest. I always add a bit more pepper because I like the slightly peppery taste. When the meat is softening nicely after an hour or so, add small peeled potatoes, and allow to simmer some more. 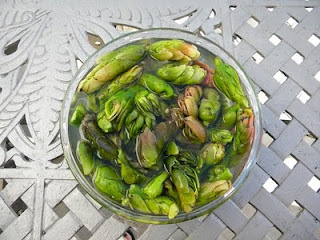 Lastly add the steamed waterblommetjies about 5 minutes before serving, so that they do not become too soft and mushy. If this stew seems to haphazard for you, use your own basic lamb stew recipe, remembering to keep it simple. The subtle flavour of the waterblommetjie is supposed to be the hero, here. But follow my instructions for the waterblommetjies, both the cleaning bit and then lightly steaming it before adding it to the stew at the last minute. I don't know much, but I know this. We ate the bredie with a beautiful bottle of Secateurs 2006 Red, from AA Badenhorst Family Wines, made by our mutual friend, the divinely gifted Adi Badenhorst. And afterwards we ate koeksusters bought from Melissa's in Kloof Street, and tiny milk tarts from Woolies. A South African celebration. Waterblommetjies, koeksuster, melktert. When all else is lost, the flavours remain.